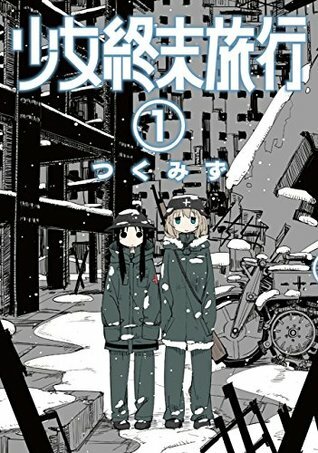 So this one is getting an anime, though I have been curious about this manga for a long time before that was announced. I have to say it was pretty decent, though it was a bit boring, and I wish we had gotten a bit more information on this world of theirs. What happened to Earth? What will happen to this Earth and the people still existing on it? Why don’t they go into the buildings (maybe there is still food to be found there)? I am guessing as the story progresses we will see more of this world (and not just of this giant city the girls are traversing), and maybe get some answers. Yuu and Chii were good characters though they are a strange pair. Considering they have been together for quite some time, I am guessing they are friends, however I just didn’t see it. More often than not I just saw two girls forced to be together. At times I disliked Yuu because of her attitude and how, even though she was supposedly friends with Chii, she stole her food and threatened her with a gun. Ever heard of sharing? Also the way she barely listens to a word anyone says. I also like that we meet another person, and an interesting person at that. I hope we will see more of him, and I want to wish him luck with his maps. Art was so-so (body proportions are wacky, the art seemed hurried), but it did fit with the story and the world. All in all, I think I will not read this further and rather wait for the anime to come out. Maybe this story works better there.